With the facelifted Toyota 86 having arrived in Europe, Toyota has released a considerable gallery of images of the revised sportscar. To recap, the updated 86 (badged GT86 in the UK) for the European market makes do without the intake and exhaust revisions which give the US- and Japanese-market cars a mild output increase to 207 PS and 212 Nm of torque; the European cars retain the pre-facelift model’s 200 PS and 205 Nm of torque. 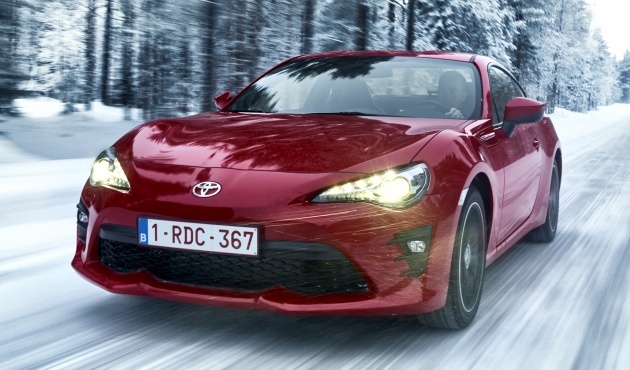 One of the key developments for the updated 86 is the inclusion of Track Mode, which gives the driver a wider scope with which to enjoy performance driving before the stability control systems intervene. “Detailed adjustments have been made to the suspension and damping,” and along with increased bodyshell rigidity, the 86 now benefits from improved handling, stability, and ride comfort, according to Toyota. Inside, the cabin has been updated with a smaller, multifunction steering wheel measuing 362 mm in diameter, while the rev counter in the middle of the instrument cluster has been reoriented to show 7,000 rpm (where peak power is made) at the 12 o’clock position. Fuel economy, journey distance, power and torque curves, a stopwatch as well as a G-force monitor can be displayed via a new 4.2-inch multifunction display. The driver-oriented car is a concept not lost on Toyota, least of all on its company chief, Akio Toyoda. “If it’s not fun to drive, it’s not a car,” Toyoda said. Data and feedback gleaned from Toyota’s participation in the Nürburgring 24 Hours with Toyota Gazoo Racing has influenced the changes made towards the revised coupe for the 2017 model, the company says. Check out the 145-image gallery below. Like what you see of the updated Toyota 86? In Australia, my Aussie fren said Toyota 86 is like normal car for him. Cheap price. He could not believe me when I told him this car is like RM200k. So u r saying u r clever than Toyota? Or VW is more clever than Toyota? Toyota can make a Better sports car than VW capable of (corrado, scirocco versus mr2, celica, supra). The formula for gt86 is not out and out performance but the best fun. Engine is low, FR chassis providing almost neutral handling and best weight distribution. It was never intended to be powerful, duh. The whole idea of the F86/Celica/MR2 line was to produce cheap, small-engine cars that handle well. Sorry if you didn’t get the memo. Toyota 86 was not intended to be a powerful car, DUH! It’s designed in the tradition of the Celica/MR2, to be cheap, and handle well. DERP. Sorry if you didn’t get the memo. Aussie friend . Friend’s friend.Aussie’s friend’s friend. All made up comments. No wonder you are the infamous kunta. ya,his BS level is too high! Agree with U Kunta. Chukurlah kita sampai Botak dengan GST & Excise Duties sampai tak mampu beli Kapcai. Why u agree with own dupe? too bad…toyota no gut and still using subaru boxer engine…..
Several reasons for the collaboration. First . toyota wants super low gravity point. Boxer does that better than any inline or bee engines. Second. Subaru will want the collaboration. They provide engine, but they get chassis. They win more than toyota. Sadly, with our tax structure and UMW’s policies, this car is a premium here and not the everyday sports car that Toyota intended it to be. Less of these cars is better. We alredi got enuff problems with pipu thinking their vios is 86. “If it’s not fun to drive, it’s not a car,” says Toyoda. Really? Then why come out with vios, corolla, camry? Back then the NSX, RX7, Fairlady 300ZX all came with 4 speed auto options. All show, no go sort of car…. This GT86 really kasi malu the real AE86….